Enter your dates to pick from 47 hotels and other places to stay! Sunborn Gibraltar offers unique accommodations, onboard a yacht. Located in Gibraltar, this luxury 5-stars yacht-hotel offers an infinity swimming pool, a casino, a spa, a gym and a restaurant. Sunborn boat is just amazing. It's an awesome experience to stay there. Staff was very helpfull, everything was clean, the rooms well equipped and the infinite pool is amazing. Very good. 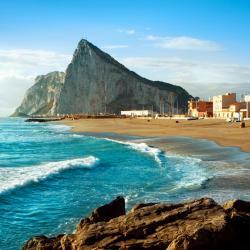 On the tranquil Eastern side of the Rock, this 4-star Gibraltar hotel features stunning views of the Mediterranean Sea. It has a restaurant, a grill with al fresco dining and a health and beauty club.... Staff were very friendly and the service was excellent. Breakfast was very nice and good value for money. A very nice hotel in which to unwind and relax. Recommended. Offering a subtropical garden and a swimming pool, Bristol Hotel is located just a 2-minute walk to the main street in Gibraltar. The Rock of Gibraltar is just 1.9 mi away. You had a pool and we could use a kettle. So nice! Thanks! Featuring an outdoor pool and sea views, studio in WestOne is located in Gibraltar. The apartment is 1.1 miles from Cathedral of the Holy Trinity. The room was beautiful with a sea view whilst also overlooking the rock. The room was spotless too. Very cute kitchen and lovely bathroom. Little touches such as the box of toffees and bottle of prosecco in the fridge were greatly appreciated. We accidentally locked ourselves out of the apartment one night and Man-Ho very quickly responded to our concern and had a locksmith with us within the hour. The apartment itself is quite central with only a few minutes walk to main Street and ocean village. Overall the room was great value for money in a terrific location and would highly recommend staying here. Arcadia 408 is located in Gibraltar and offers barbecue facilities, a garden and a terrace. This apartment has air-conditioned accommodations with a balcony and free WiFi. Excellent 2 room apartment in a large complex on a semi-private beach, on the almost deserted eastern face of the Rock. We were picked from the airport and driven to the property (we also walked the way there just for fun; when the North way into the city is open, that's 30min walk); The 2 rooms, bathroom, kitchen and large patio are decent (wifi, books, boardgames, even TVs we didn't use), and we were able to shop twice in the city and spend the rest of the week away from crowds. Set in Gibraltar on a private and peaceful berth within the Ocean Village Marina, a 5-minute walk to the city center, Luxury Yacht Hotel offers accommodations with free WiFi. Fantastic stay from start to finish, great location. Everything you could want was available on arrival by Fernando who was a great host. Will stay again when back in Gibraltar. Thanks Fernando. Located in the business district of Gibraltar, Eurotowers Complex Gibraltar offers access to a rooftop swimming pool and free Wi-Fi is offered. Great location, very easy off the 5 bus from the border. Located in the heart of Gibraltar, this air-conditioned apartment is 558 feet from Casemates Square and 722 feet from Main Street. Cozy, but comfortable Gibraltar apartment. First stay in the city, so accommodation layout took some getting used to. Clean and functional, meet all needs. Great location adjacent to walled city. Providing free WiFi, Engineer Guest House is located in Gibraltar, a 15-minute walk from Cathedral of Saint Mary the Crowned and one mile from Cathedral of the Holy Trinity. Walking distance for everything. Governor's Inn Apartments is located in Gibraltar. It is located a 3-minute walk from Cathedral of Saint Mary the Crowned and provides free WiFi. Good location, very well equipped. Everything that we needed. With wonderful views across the Mediterranean Sea, The Caleta Hotel offers award-winning food and a modern leisure center. The hotel is on the tranquil eastern side of the Rock of Gibraltar. We loved the hotel. The spaciousness of the room, the views, and very clean. Located in Gibraltar, Marina Bay Gibraltar is a self-catering accommodations, just 164 feet from the marina. Room was well stocked with anything we'd need. Wifi was good. Designer Studio in Marina Bay Square offers accommodations in Gibraltar, an 18-minute walk from Cathedral of the Holy Trinity. This property is one mile from Cathedral of Saint Mary the Crowned. OV pool offers accommodations in Gibraltar, 1.4 miles from Cathedral of the Holy Trinity and 1.5 miles from Cathedral of Saint Mary the Crowned. Sir Herbert Miles Road offers accommodations in Gibraltar, 2.2 miles from Cathedral of the Holy Trinity and 2.3 miles from Cathedral of Saint Mary the Crowned. Complete with a tennis court and a terrace, 206 Endeavour Both Worlds is located in Gibraltar, 2.6 miles from Cathedral of the Holy Trinity and 2.7 miles from Cathedral of Saint Mary the Crowned.